Given the diversity of business and organizational contexts, and EA still a fledgling discipline, spelling out a job description for enterprise architects can be challenging. Concepts : eight exclusive and unambiguous definitions provide the conceptual building blocks. Models: how the concepts are used to analyze business requirements and design systems architectures and software artifacts. Processes: how to organize business and engineering processes. Architectures: how to align systems capabilities with business objectives. The objective being to define the core issues that need to be addressed by enterprise architects. Analysis models describe business environments and objectives. Design models prescribe how systems architectures and components are to be developed. Enterprise architects must focus on individuals (objects and processes) consistently identified (#) across business and system realms. That distinction is not arbitrary but based on formal logic: analysis models are extensional as they classify actual instances of business objects and activities; in contrast, design models are intensional as they define the features and behaviors of required system artifacts. Relevant categories at architecture level can be neatly and unambiguously defined. Actual containers represent address spaces or time frames; symbolic ones represent authorities governing symbolic representations. 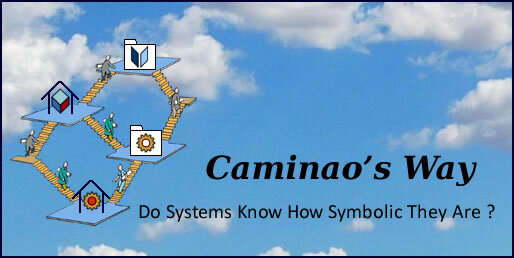 System are actual realizations of symbolic containers managing symbolic artifacts. Actual objects (passive or active) have physical identities; symbolic objects have social identities; messages are symbolic objects identified within communications. Power-types (²) are used to partition objects. Roles (aka actors) are parts played by active entities (people, devices, or other systems) in activities (BPM), or, if it’s the case, when interacting with systems (UML’s actors). Not to be confounded with agents meant to be identified independently of their behavior. Events are changes in the state of business objects, processes, or expectations. Activities are symbolic descriptions of operations and flows (data and control) independently of supporting systems; execution states (aka modes) are operational descriptions of activities with regard to processes’ control and execution. Power-types (²) are used to partition execution paths. Since the objective is to identify objects and behaviors at architecture level, variants, abstractions, or implementations are to be overlooked. It also ensues that the blueprints obtained remain general enough as to be uniformly, consistently and unambiguously translated into most of modeling languages. Business process modeling languages are used to associate business domains and enterprises organization. Domain specific languages do the same between business domains and software components, bypassing enterprise organization and systems architecture. Generic modeling languages like UML are supposed to cover the whole range of targets. Languages like Archimate focus on the association between enterprises organization and systems functionalities. Contrary to modeling languages programming ones are meant to translate functionalities into software end-products. Some, like WSDL (Web Service Definition Language), can be used to map EA into service oriented architectures (SOA). While architects clearly don’t have to know the language specifics, they must understand their scope and purposes. Processes are solutions to business problems. Processes (aka business solutions) induce problems for systems, to be solved by functional architecture. Implementations of functional architectures induce problems for platforms, to be solved by technical architectures. As already noted, enterprise architects are to focus on enterprise and system layers: how business processes are supported by systems functionalities and, more generally, how architecture capabilities are to be aligned with enterprise objectives. Nonetheless, business processes don’t operate in a vacuum and may depend on engineering and operational processes, with regard to development for the former, deployment for the latter. Enterprise architects should take a holistic view of business, engineering, and operational processes. Given the crumbling of traditional fences between environments and IT systems under combined markets and technological waves, the integration of business, engineering, and operational processes is to become a necessary condition for market analysis and reactivity to changes in business environment. Hence the benefits of combining bottom-up and top-down perspectives, the former focused on business and engineering processes, the latter business models and organization. Enterprise architects could then focus on the mapping of business functions to services, the alignment of quality of services with architecture capabilities, and the flows of information across the organization. On one hand they have to define the concepts used for the organization, business domains, and business processes. On the other hand they have to specify, monitor, assess, and improve the capabilities of supporting systems. In between they have to define the functionalities that will consolidate specific and possibly ephemeral business needs into shared and stable functions best aligned with systems capabilities. As already noted, enterprise architects don’t have to look under the hood at the implementation of functions; what they must do is to ensure the continuous and comprehensive transparency between existing as well a planned business objectives and systems capabilities. Whatever their nature (enterprise organization or systems capabilities), the life-cycle of assets encompasses multiple production cycles, with returns to be assessed across business units. On that account enterprise architects are to focus on the assessment of the functional architecture supporting business objectives. By contrast, the assessment of business applications can be directly tied to a business value within a specific domain, value which may change with cycles. Depending on induced changes for assets, adjustments are to be carried out through users’ stories (standalone, local impact) or use cases (shared business functions, architecture impact). Enterprise architects deal with assets, business analysts with processes. The difficulty of assessing returns for architectural assets is compounded by cross dependencies between business, engineering, and operational processes; and these dependencies may have a decisive impact for operational decision-making. Data understanding gives form and semantics to raw material. Business understanding charts business contexts and concerns in terms of objects and processes descriptions. Modeling consolidates data and business understanding into descriptive, predictive, or operational models. Evaluation assesses and improves accuracy and effectiveness with regard to objectives and decision-making. Observation: understanding of changes in business environments (aka territories). Orientation: assessment of the reliability and shelf-life of pertaining information (aka maps) with regard to current positions and operations. Decision: weighting of options with regard to enterprise capabilities and broader objectives. Action: carrying out of decisions within the relevant time-frame. Seamless integration of data analytics and decision-making. Along that perspective data analytics and decision-making can be seen as the front-offices of business intelligence, and knowledge management as its back-office. More generally that scheme epitomizes the main challenge of enterprise architects, namely the continuous and dynamic alignment of enterprise organization and systems to market environment, business processes, and decision-making.